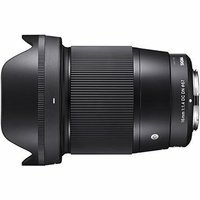 Designed specifically for mirrorless cameras, the Sigma 16mm f/1.4 Contemporary lens offers image clarity that rivals Sigmas premium Art range. A bright aperture of just f/1.4 makes shooting in low-light a breeze, while also offering greater depth-of-field control. This version of the lens is for Sony E mount mirrorless cameras, such as the Sony A6500 or A7 series (in cropped sensor mode).